Are you seeking clarity on what the cloud can do for you? Are you considering migrating applications to the cloud? Do you need to assess the financial benefits of the cloud for your organisation? Cloud Computing enables you to deliver services more rapidly and adapt to changing public demands. You only pay for what you use, getting more from your budget. You align your infrastructure capacity to demand and avoid over provisioning to meet peaks. At Wolberry, we champion hybrid cloud solutions. We are expert in helping you to optimise current on-premise infrastructure, to move data and workloads to the cloud, and to reduce costs and improve business agility. 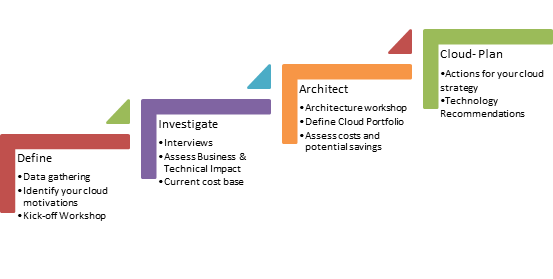 We assess the cloud adoption opportunities for your application portfolio. We model for you the Total Cost of Ownership of cloud solutions and ensure the benefits are real. We devise with you the optimum Cloud Plan to move to the appropriate hybrid Amazon Web Services (AWS) Cloud. Find out more about Wolberry’s Cloud Backup, Cloud Disaster Recovery and Cloud Storage services. At Wolberry, we believe most organisations will need to plan how to move to the cloud whilst optimising returns on investment of existing IT infrastructure. Is your business case for Cloud approved and want to fast track delivery with Amazon Web Services (AWS)? Cloud can be complex. Do you need to make it work in a simple reliable way? Want to reduce the risk of cloud migrations? Wolberry works with you to get the best balance between on premise and cloud infrastructures for your business. As an AWS Consulting Partner, we provide expert design and integration professional services. We help you migrate applications hosted on Windows or Linux physical servers, Microsoft Hyper V, and VMware virtual machines. We have developed methods to automate workload and data migrations as well as refactoring applications suitable for the cloud.